After the Global Rallycross Championship series folded earlier in the year, U.S. fans were uncertain on how they were going to get their rallycross fix. Luckily, the Americas Rallycross (ARX) Championship was formed to fill that void with many former GRC crews like Subaru Rally Team USA and Andretti Volkswagen Rallycross Team bolstering the field. This weekend was the first event of the series actually held on American soil, the season-opener being hosted in Britain—more specifically, the historic Silverstone Circuit. Andretti Volkswagen driver Tanner Foust took the first round in his Volkswagen Beetle rally car, followed by his teammate Scott Speed, and Liam Doran took the last spot on the podium in his Citroen DS3 machine. This time, it was Speed who took the top spot at Circuit of the Americas. His back-and-forth battle with Ken Block provided the entertainment and proved to be the closest fight of the night as he was nearly unbeatable around the recently-built infield track. 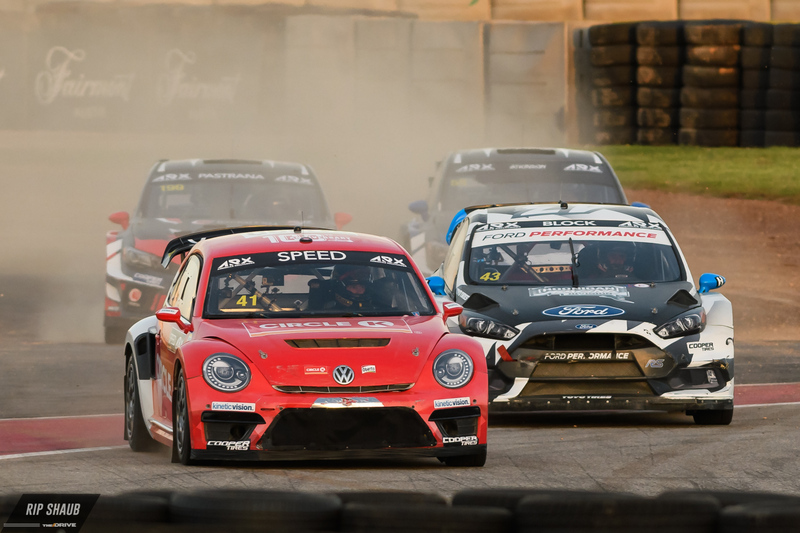 The drama continued into the final where Block was ultimately defeated, having the door shut on him by Speed, himself a three-time GRC champion. When being interviewed during one of the semi-final heats, Speed mentioned Block by saying, “that guy is always running into someone.” In the post-race interview, a reporter referred to the final round as easy for Speed to which he responded: “That was not easy, I had to brake 50 meters before the first two corners because I was getting plowed in the back by the 43.” He was, of course, referring to Block’s No. 43 Hoonigan Ford. Block got his word in, though. Being arguably the king of burnouts and donuts, during his post-race interview, Block responded to the applause for his celebratory spins in the infield by saying, “Scott was doing some pathetic donuts, so I had to show the fans what it is really all about.” A hysterically laughing Lasek then commented “Hey, Ken! you should tell us how you really feel,” after saying the same thing about Speed. Speed’s Andretti Autosport teammate Tanner Foust grabbed the third and final spot on the podium at day’s end. Now that the drama has settled, there is a new leader in the Americas Rallycross Championship standings. Speed leads Foust by 1 point, 56 to 55 respectively. Subaru driver Patrik Sandell is in third place, but 16 points behind Foust. He is followed by fellow Subaru driver Chris Atkinson with 29 points and COTA second-place finisher Block who now has 24 points after not participating in the first round at Silverstone. 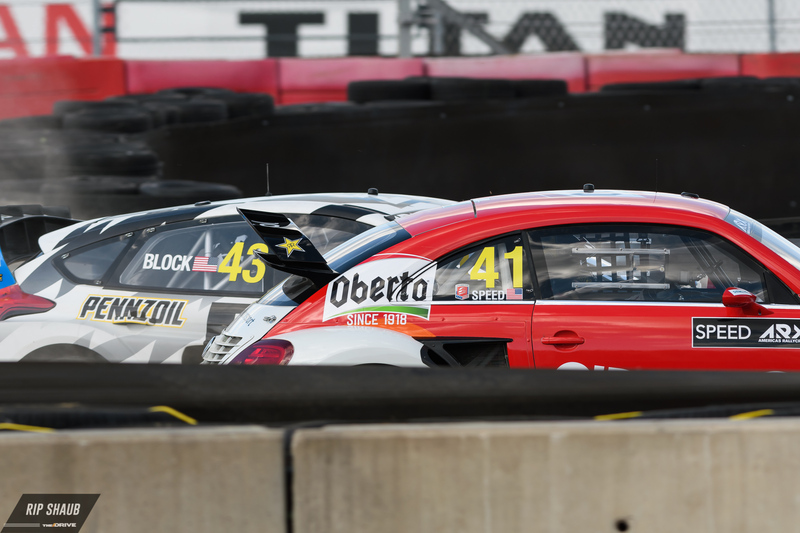 The next event on the Americas Rallycross Championship calendar brings the drivers to Trois Rivieres, Quebec, Canada on August 4-5. Scott Speed clinched his third consecutive Red Bull Global Rallycross Supercars championship in Saturday’s season finale at the Port of Los Angeles. Meanwhile, Volkswagen Andretti Rallycross teammate Tanner Foust took the race win. Speed and Foust entered the weekend with only 30 points separating them, while Loenbro Motorsports’ Steve Arpin remained alive in the championship hunt as well. Foust pared down the lead to 24 with a perfect trio of heats, setting up a showdown in the final with both drivers on the front row, while Arpin was mathematically eliminated in the early stages of the event. Foust won the finale, while Speed recovered from a slow start to climb back to second place in the late stages of the final, while Patrick Sandell finished third. Speed’s runner-up finish gave him the points championship over Foust by an 826-807 margin.